Andrew Cuomo, New York’s Governor, has a mission, and that mission is clearly stated in his mantra: New York is Open for Business. Governor Cuomo believes, and I do as well, that to insure a safe and prosperous future for all New Yorkers, there must be jobs available that provide a livable wage for all New Yorkers. To that end, two years ago, he created ten Regional Economic Development Councils and charged them with the task of devising a regional plan to promote business growth and development that would increase the availability of jobs in each region. Over the last two years, he has provided special funding for projects in each region that supports these goals. I have had the privilege of being one of two people from Rockland to represent the county on the Mid-Hudson Regional Economic Development Council (MHREDC). In the fall of 2012 Rockland’s plan was selected as one of the top four plans, and the region was awarded almost $100,000,000 to support that plan. While there were only one or two projects in Rockland, RCC is part of a regional initiative to bring advanced manufacturing to the region through the Global Advanced Manufacturing Consortium. Specifically, RCC will develop a Proof of Concept Center at our site at Haverstraw. This will aid small businesses in developing three-dimensional designs of products they hope to manufacture. RCC is able to do this because of our Computer-Assisted Design Program, which we can offer both for credit and for non-credit. Further, at Haverstraw we will create a Business Services Center to assist residents who are developing small businesses. We are able to do this because of our ongoing cooperative agreements with our Small Business Development Center (SBDC), SCORE, and our local Workforce Investment Board (WIB). RCC is also part of a grant submission to expand our Advanced Manufacturing efforts over two regions in a project developed with SUNY IT. This project would also allow RCC to expand and enhance its Engineering Science Program, which was approved by SUNY two years ago. This opens the doors to other exciting possibilities. The Governor’s commitment to jobs and Workforce Development was again emphasized this week with the introduction of the state’s next budget. The budget contains a special $3,000,000 allocation available to colleges that can demonstrate an increased number of graduates in associate degrees in Occupational Studies and Applied Studies, degrees that qualify students for immediate employment. Also, funding will be available to colleges that offer degrees that are cited by the Department of Labor because of the demand for qualified workers in these areas. These initiatives are exciting and are also challenging for RCC. I am confident that the college will meet this challenge both to support economic development and to provide quality programs for students who wish to transfer. 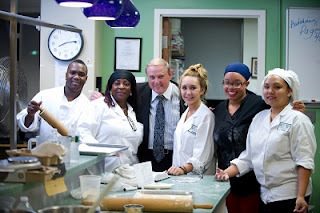 President Wood visits with students in an Introduction to Baking class, which is part of RCC’s Hospitality & Tourism Program. Hospitality is one of the growth industries identified for the Mid-Hudson Region.